This page was created by Angela Mesna, a senior English major at UCSB (link to author page). I became interested in Ilse because of her nickname and decided to more research on her. Most of my information came mainly from various Internet sources (sources). There is little known about the early years of Ilse Koch. She was born in Dresden Germany in 1906. She worked in the Sachsenhausen concentration camp before marrying her husband Karl Koch in 1937. When her husband was appointed to be commandant at the Buchenwald concentration camp she willingly went with him. Ilse did not opt for the removed position of a wife of a camp official but rather became an SS Aufseherin (overseer) of the camp. Ilse used the position to express her sadistic and cruel nature. She was known for riding her horse through the camp and whipping and beating any prisoner who caught her particular interest. 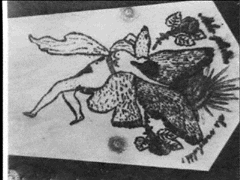 She would also ride through the camp and select specific prisoners with tattooed skin or interesting skin markings. She had these individuals killed and their skins tanned in order to make lampshades and other household items. This is a picture of a lampshade made of human skin found in Koch's apartment. The drawing is a tattoo that was on the man's chest. It is difficult to determine whether Ilse Koch was a product of Nazi ideology and anti-Semitism or rather found the Holocaust as an opportunity to divulge in her already sadistic nature. Because there is little available on her childhood and early childhood behaviors, it is difficult to attempt to make a definitive answer. What is clear is that this woman found, under the rule of Hitler, the capacity in herself to brutally torture her prisoners and keep pieces of them for her personal decoration.